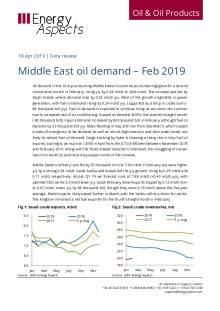 European oil demand fell for the third straight month in November 2018, dropping y/y by 0.41 mb/d to 15.38 mb/d. The contraction was driven entirely by the EU-5 countries (-0.4 mb/d), led by Germany (-0.37 mb/d y/y). German declines were led by naphtha, which fell by 0.19 mb/d y/y, dragging total European naphtha demand lower y/y by 0.23 mb/d. German diesel declines eased to 54 thousand b/d, although total European diesel demand still reversed into declines of 0.16 mb/d amidst weak readings from Turkey, UK and France. Total French demand dropped by 49 thousand b/d (diesel by 39 thousand b/d), hurt by anti-government protests that forced President Emmanuel Macron to scale back reform initiatives. This affected French demand in December 2018 too, with preliminary December 2018 data showing a 10.1% y/y reduction in diesel demand and a 4.2% drop in gasoline usage. It is likely that December 2018 European demand also fell y/y, although with the improvement in Rhine levels, restocking by end-users in Germany has picked up in January, which will support overall European demand this month. Refinery runs fell by 85 thousand b/d m/m to 12.37 mb/d in November 2018, lower y/y by 0.76 mb/d and lower than our estimates of 12.40 mb/d. Heavy CDU maintenance weighed, with 1.8 mb/d of capacity offline across the region (+1.1 mb/d y/y). German runs remained low at 1.56 mb/d in November 2018 (-0.36 mb/d y/y) and likely remained subdued in December 2018 too on extremely low Rhine levels, which reached a low of 34 cm at the Kaub chokepoint on 1 December 2018 but picked back up above 200 cm in January. Total European runs will have risen m/m in December 2018 as CDU outages eased to 0.7 mb/d (+0.2 mb/d y/y), but likely remained lower y/y. The m/m decline in December 2018 maintenance was led by the Netherlands (-0.21 mb/d), as flows resumed at ExxonMobil’s 0.2 mb/d Rotterdam refinery, which is now fitted with an upgraded hydrocracker, and Shell’s 0.4 mb/d Pernis refinery ramped up. In Portugal, maintenance fell m/m by 0.20 mb/d, as planned works at Galp’s 0.22 mb/d Sines refinery came to an end in early-December. Runs at the refinery remained largely unaffected despite a strike at the facility, as the government has demanded operations continue with skeleton crews, avoiding a shutdown. In Q1 19, we expect European runs will average 12.4 mb/d (-0.2 mb/d y/y).